If you have an annoying relative who is into motor racing, this book will guarantee total silence for the whole of the Christmas holiday. Buying this statistical compendium of motor racing means that you can throw away all you other reference books as this tome (900 pages crammed into a book 5cm wide) includes a full table of results from each Grands Prix since 1950 (including non-qualifiers) plus a short synopsis on every season. 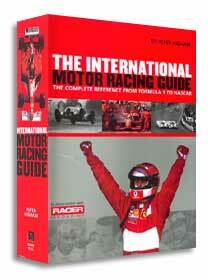 There are details of the rules, the manufacturers, records, the winners of non-championship races, details of major events before the World Championship, Formula 2, Formula 3000, European Formula 3, the Le Mans 24 Hours, the World Sports Car Championship, the Indianapolis 500, AAA, USAC, CART and IRL, NASCAR, Tasman, CanAm, BMW M1 Procar and the FIA Touring Car Championships. These are then followed by national sections giving an overview of race tracks in different countries and the results of the major events in that country, ranging from the Temporada series in Argentina, through Formula Holden in Australia to Danish Formula 3, South African sports cars to IMSA and even Barber Dodge. Finally there is an A-Z section with a very brief analysis of the careers of more than 2000 drivers from Rauno Aaltonen to Ricardo Zunino. This is an amazing work which has taken Peter Higham thousands of hours over the last 20 years to research and compile. The accuracy is spectacularly good and the only criticism, if there is one, is that Higham has left little room for improvement. Perhaps the World Rally Championship?